There are many common causes of constipation and although every person’s bowel movements are different, going more than three days without a bowel movement is a sign of being constipated. Someone is also considered to be dealing with constipation if twenty-five percent of their bowels are hard or they are experiencing straining during the bowel movement process. By recognizing what is causing the constipation, a person can usually resolve the problem themselves. However, if constipation occurs frequently, a doctor may be able to determine if something more serious is causing the problem. 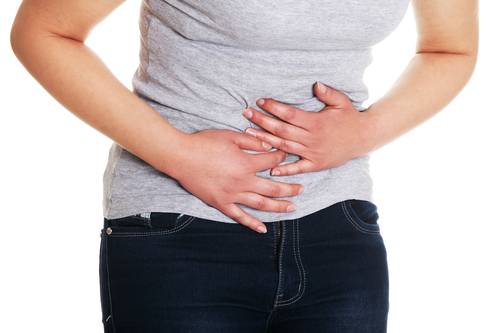 If the body is not getting enough water, the digestive system may not function properly. It is recommended that women drink at least 2.2 liters of water per day and men should take in about 3 liters. Drinking the adequate amount of water each day can help prevent constipation and other digestive discomforts. To improve bowel movements an adult should consume more insoluble fiber than soluble fiber. The average adult should strive to eat a total of about 25-35 grams of fiber per day. Whole grains, lima beans, asparagus, and rolled oats are all great sources of insoluble fiber that may help reduce the occurrence of constipation. Prescription pain killers, blood pressure medications, anti-depressants, and OTC vitamins and pain relievers may all be causes of constipation. OTC antacids can also cause irregular bowel movements if taken too often. If constipation is being caused by medication, the situation should be discussed with a doctor. Stress, travel, lack of sleep, and many other changes in a person’s regular routine can cause the body’s digestive system to not operate properly which can lead to constipation. If a change in routine has caused constipation, a laxative may help temporarily relieve the constipation until the person can get back to their regular routine. If a person has repeated occurrences of constipation due to stress, pregnancy, or side effects of medication they are taking and they use stool softeners or laxatives for an extended period of time, they may actually cause their system to become more constipated. When using stool softeners and laxatives, the directions on the medication should be followed carefully and if a person is feeling the need to take them on a frequent basis, they should discuss the situation with their doctor. Some women experience constipation during and after pregnancy. After childbirth, constipation can occur for days, weeks or even months for some women. Women should see their doctor to determine if stool softeners or laxatives are safe to take while pregnant or breast feeding. Some people experience constipation when they consume too much dairy. This could be caused by the body not being able to break down the excessive amounts of calcium when too much dairy is consumed within a short amount of time. Increasing fiber intake after consuming too much dairy is one way to relieve the constipation. A less common reason for constipation is hemorrhoids. Some people resist having a bowel movement to avoid the pain caused my hemorroids. Common causes of constipation,like the ones listed above, can also occur and make the bowels harden, which in turn, can flare up hemorrhoids. Hypothyroidism causes the body’s metabolic process to slow down due to an underactive gland. If someone is continually getting constipated and the common causes are ruled out, a doctor may require a blood test to determine if the excessive constipation is due to hypothyroidism. People with IBS often suffer from constipation and doctors use a variety of methods to relieve the symptoms of IBS and constipation. Some people may develop IBS due to stress and therefore have trouble relaxing the muscles in their body in order to move their bowels properly. Behavioral therapy, biofeedback, and hypnosis have reportedly been used to help some patients relieve all the symptoms of IBS, including constipation. The causes of constipation can sometimes be easy to figure out and other times may require the help of a doctor. Once the cause is determined, there are many simple ways to relieve the discomfort and return to normal healthy bowel movements. Review Of Tadalafil In The Treatment Of Erectile Dysfunction.